Wing movement provides lift as well as the propulsion needed to overcome "drag" and to gain speed. The bird's wing movement might be compared to a swimmer's doing the "butterfly stroke." His arms rotate around his shoulder joint, as he throws them forward through the air and then pulls them back through the water. Flight, however, is far more complex, involving the rotation of the wing and the relative movements of various parts of it. The faster the bird travels, the more lift will come from the air passing around the wings. It has been calculated that a pigeon first taking off uses five times as much energy as when it reaches steady flight. 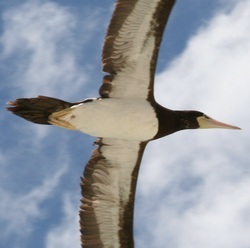 With most larger birds, the increased wingspan is still not large enough to cope with their extra weight and greater drag, especially when taking off. So some of these, such as the pelican, run on the ground for a few feet to gain speed for lift. Others, such as the vultures, land on a tree or fence and then, by jumping off, gain enough speed through the pull of gravity for their wings to provide lift. To coordinate the movements require for flight , birds have well-developed sense organs. They also have a brain that can quickly interpret and respond to a lot of incoming signals. A birds brain is relatively large for its body size. 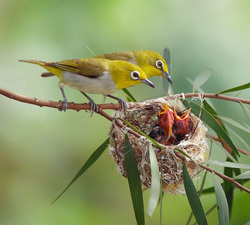 The cerebrum which controls such behaviors as flying, nest building, and taking care of young. 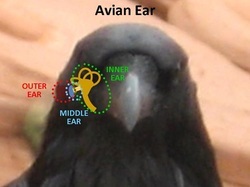 Birds have extraordinarily well developed eyes and sizable optic lobes in the brain. Birds see color very well - in many cases, better than humans. Most birds species can also hear quite well. The senses of taste and smell however and not as well developed in most birds.